Time for another installment of Beer of the night. 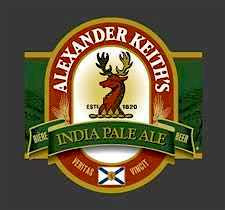 Tonight's beer is Alexander Keith's India Pale Ale. This beer is brewed exclusively in Halifax, Nova Scotia, Canada. This beer is a favourite by many, specifically by people from the Canadian Maritimes, but also people from the rest of Canada. When I first tried this beer, I didn't really like it at all, but as time went on, I grew to love this beer, this is a very good beer on tap, one of the best 'on-tap' beers I've ever had. I find that it's more expensive than most domestic beer, maybe that's due to being only brewed at one location or because it's sort-of a speciality beer? Who knows. Here in Manitoba Canada, you can get a 6 pack of bottles for around $8.65 before taxes, or a 12 for around $18 before taxes. It's more expensive than Kokanee or Labatt Blue but it's worth it if you love ale beers. This was feature that originally came from my now defunct blog on Spymac.com. Reposted in August, 2009.